With the increasing demand of the precision technology in various industries and our daily life, microsystem technologies play a more important role, and attract the sight of researchers to devote to the field. This Special Issue aims to present some innovative contributions of the field. It comprises 14 papers recommended from the Six International Multi-Conference on Engineering and Technology Innovation (IMETI 2017) which was held from October 27 to 31, 2017, Hualien, east Taiwan. It covers a wide range of fundamental investigations, engineering applications, and industrial practices by employing the knowledge of microsystem technologies. 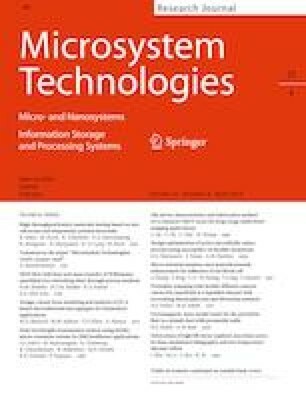 All of the manuscripts underwent a rigorous peer-review followed the review guideline of Microsystem Technologies. Acceptance into this Special Issue was based on the reviewers’ recommendation, mandatory revisions, and final examination by the Guest Editor. It is expected to be a significant issue related to microsystem technologies. I would like to express my deepest thanks to the reviewers for taking the time to comment on the articles. In addition, I appreciate the authors who submit their new research findings to the Special Issue. Special thanks must be given to the Editor in Chief/Prof. Bernd Michel for his kind supports to the publication of this issue. Finally, I would like to thank the editorial team for the work making this special issue possible.